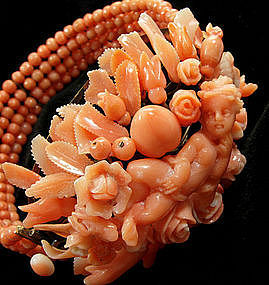 Spectacular and big antique bracelet made from pink coral beads and matching flower form carved coral elements, centered by an amazing full length carved coral three dimensional cherub or putto, all wired on a gold frame. Circa 1850. The center element and the clasp element are hinged to the sides. With a slide clasp with a carved coral cabochon. The color is warmer than the photos depict. Great size -- 1 1/2 inches wide at center and with a wearable length of 6 7/8 inches. Excellent condition. There is a recess at the top of the figure's head where the wire ends, as shown. I've consulted with a professional estate jeweler and their opinion is that this is the original construction with no missing pieces. It is not visible when the piece is worn. Photos enlarged to show detail.